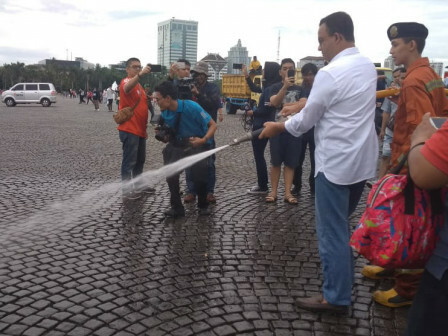 Jakarta Governor, Anies Baswedan appreciates janitor's performance who have worked fast to clean up trash after new year's party ended, including Monas, Central Jakarta.
" Let us appreciate their hard work as janitor who always do their best to maintain Jakarta clean and neat"
"I came here to see them and convey my gratitude. Let us appreciate their hard work as janitor who always do their best to maintain Jakarta clean and neat," he expressed after monitoring Monas area, Tuesday (1/1). "We sprayed the Monas area this morning. We deployed three fire trucks for this purpose," stated Anies who also sprayed the road along with another personnel. "Public awareness on cleanliness is very important. It really helps our personnel in doing their job to maintain cleanliness. Hopefully, Jakarta will remain clean and neat," he conveyed.